5793 labyrinths found. Showing 5501-5520. Sorted by country, state, city, then zip/postal code. Labyrinth is located on the Cutthroat Climb Trail at Willapa National Wildlife Refuge. 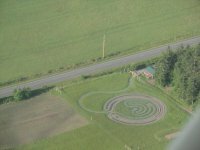 The labyrinth is located on the Cutthroat Climb Trail at the headquarters of Willapa National Wildlife Refuge. The headquarters is located north of mile marker 24 on Highway 101. Willapa National Wildlife Refuge is open from dawn to dusk every day. The labyrinth is located on the Cutthroat Climb Trail. 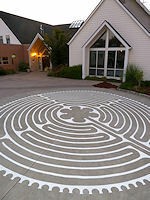 The labyrinth is in the 'back yard' of the church, and available to be walked at any time. Our labyrinth is medieval style and perhaps half the size of the Chartres one. This makes it easier to walk if you have less time or are bringing children. The campus is a short distance north of Bothell Way, near the Burke-Gilman Trail. Turn at the Episcopal Church shield sign, and go down the hill. The entrance looks like a gravel driveway. The campus is larger on the inside than it is on the outside. Scheduled, guided walks are offered on the second Tuesday evening of the month, October through May, 7:00 to 8:00 pm. Check the website for the theme for each month. In the front lawn of St. James Episcopal Church. Downtown Kent at intersection of State and Gowe, 1 block East of Central. Phone 253 854-9747 Tue-Fri, 10-3. 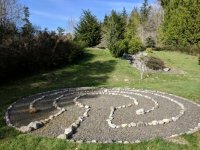 Labyrinth Peace Walk 4th Friday of month from 5-7 p.m.
4th Friday of month from 5-7 p.m.
Labyrinth is located in the North West corner behind the church. Take the path around the building to the left of the main doors. The church is located in the Rose Hill area of Kirkland, between NE 85th Street/Redmond Way and NE 70th Street, on the west side of the street. The labyrinth is indoors in the Celebration Space, just inside the front door on the right. Must call for availability! 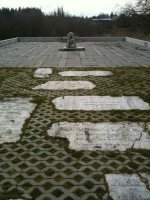 The labyrinth is currently only open for Maundy Thursday of Holy Week/Easter season. Labyrinth is located on driveway to disabled parking. Some traffic may cross the labyrinth before & after worship services and church activities. Myra Ryneheart/The Laughing Flower Labyrinth Co. Follow the southern-most entrance from 108th Ave NE (the access road) to the end of the pavement. The labyrinth is in a clearing just inside the woods, to the northeast. Located at the site of the former Western State Hospital's "Hill Ward", north of and up the hill from Lake Waughop. A nature reserve, meditation parkland & sculpture garden. On Whidbey Island in the Puget Sound (100 minutes from Seattle). Earth Sanctuary Retreat House available for reservations. Daylight hours "every day of the year, rain or shine." Fraom Anacortes, Washington, take the San Juan Ferry to Lopez Island, the Labyrinth is two miles from the Lopez Island ferry dock on Fisherman Bay Road. The driveway is marked with a flag and a sign, "Long and Winding Road"
The labyrinth is in the woods behind the church, follow the signs from the far end of the parking lot.